With more than 500 million monthly active users and a whopping 300 million daily active users, Instagram’s popularity and growth presents large and small brands with a huge opportunity to connect with a large, diverse audience. 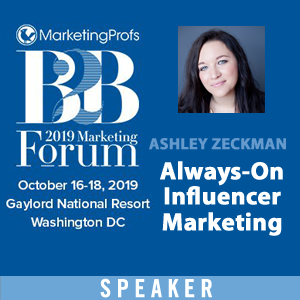 But while most B2C brands have found it relatively easy to build connections and followings on this visual social platform, B2B brands find it more challenging and are coming on more slowly. For many B2B brands, their products or services don’t always have a physical presence that’s easily recognized like most B2C brands do. In addition, B2B offerings typically don’t scream “fun and exciting” most of the time. But as the old adage goes: where there’s a will, there’s a way. 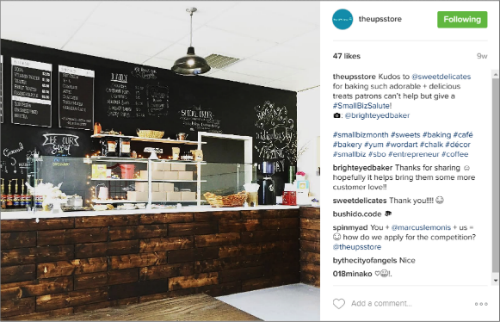 And one of those ways to help build your B2B brand on Instagram could be user generated content (UGC). 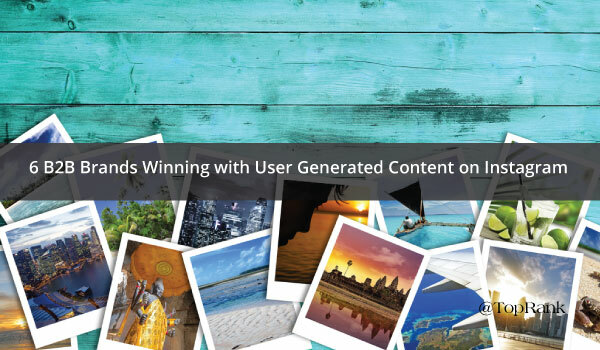 Generally speaking, user generated content is any content (e.g. blogs, tweets, posts, videos, images, reviews, etc.) created by users on an online platform. As a social media marketing tactic, UGC is quality content that’s curated or directly received from users and then shared on your social media pages, with proper credit being given to the original source. What’s So Great About UGC? Inspire engagement. People want more opportunities to share their own thoughts and opinions. If they see you engaging with their content and the content of others, you’ll likely inspire more participation in the future. Help build brand credibility and trust. Sharing content created by your audience adds a level of authenticity to your social accounts, making it more real and more trustworthy in the eyes of your audience. In fact, UGC is trusted 40% more by millennials than information they get from traditional media, according to research from Crowdtap and Ipsos MediaCT. Take some pressure off of you to create every single piece of content. UGC is one form of content curation, allowing you to share something cool with your following that didn’t take you hours to create yourself. 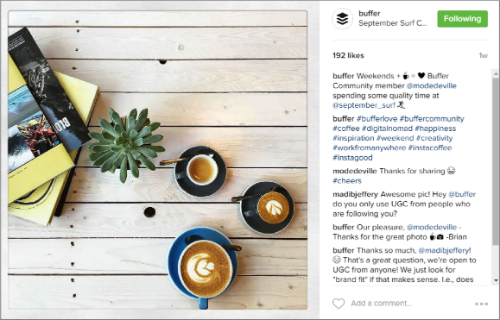 Whether your brand is just getting started with Instagram or you’re looking to take your efforts to the next level, below we dive into some examples of B2B brands using UGC as part of their strategy. And as always, we also have some tips and best practices to inspire and guide you. 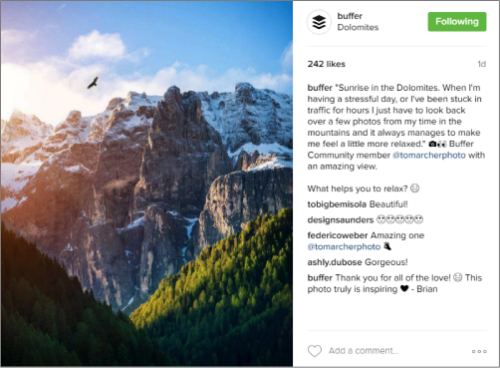 Buffer consistently curates images from its “Buffer Community” to show how other people work, play and live—while also encouraging more engagement from their followers. Below are a few examples of recent posts featuring images from their community. 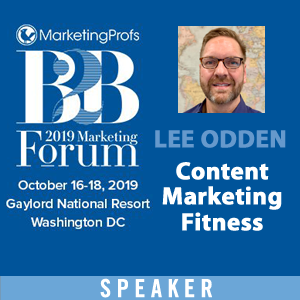 One thing you’ll notice on each post is that Buffer is actively engaging with those who like and comment in the post’s feed—thanking people for the love and asking more questions to maximize engagement. 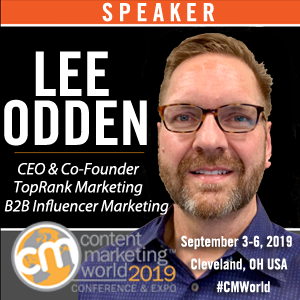 One of the big cornerstones of IBM‘s social media marketing efforts centers on connecting their products and services with events such as the Met Gala or Tribeca Film Festival, and some of that is done using UGC. 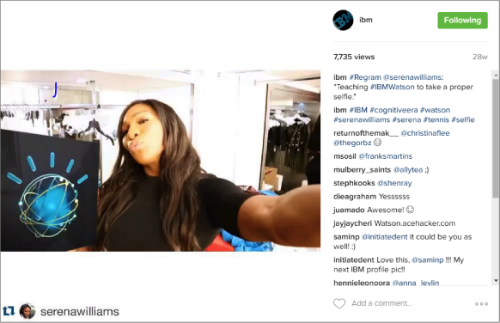 IBM reposted this video from tennis star Serena Williams, where she’s showing IBM’s Watson how to take a proper selfie. To date, the video has more than 7,700 views and a number of comments. 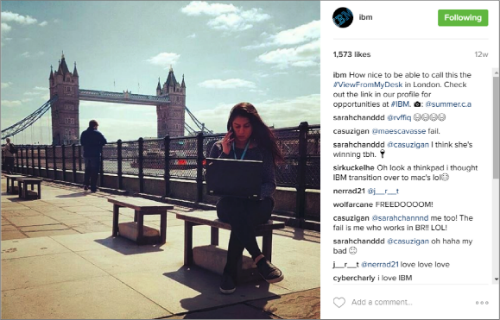 This image was originally posted by an IBM employee to give her following a glimpse of her workday. IBM shared the photo on their account and the photo captured almost 1,600 likes. 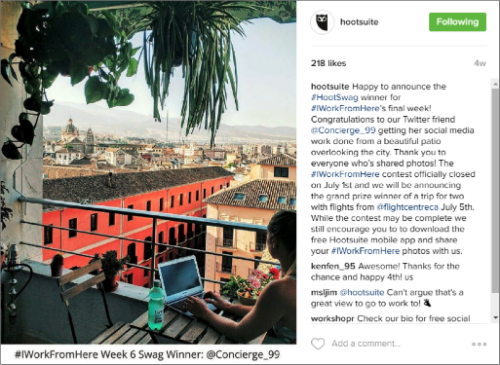 As a widely-used social media management tool, Hootsuite is all about making it easy for marketers and brands to engage and monitor their social channels. 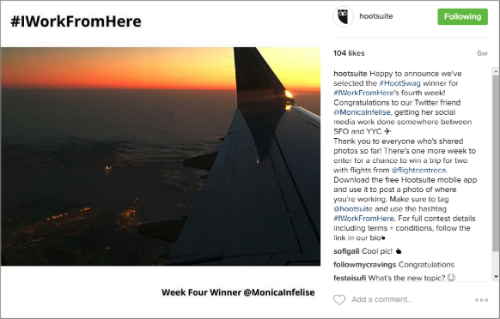 The platform’s “#IWorkFromHere” UGC campaign aimed to not only encourage Hootsuite app downloads, but also engage their followers to creatively show off how and where they do their social media work. Below are a few examples of the cool images they were able to get. The UPS Store, like other shipping and logistics companies, is interesting because it’s a B2B and B2C hybrid—serving both businesses and consumers. 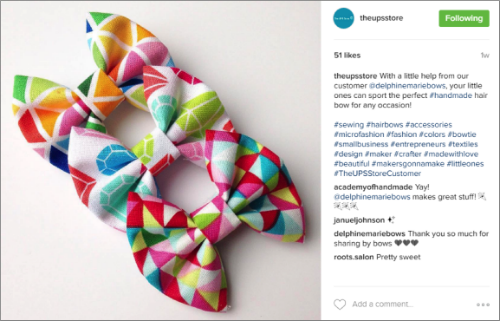 Their Instagram is nearly completely dedicated to highlighting their wide array of customers they ship for, showcasing their services and their customers’ products. They don’t boast a huge following yet, but the photos they post are gorgeous and they get pretty good engagement. Follow The UPS Store on Instagram. 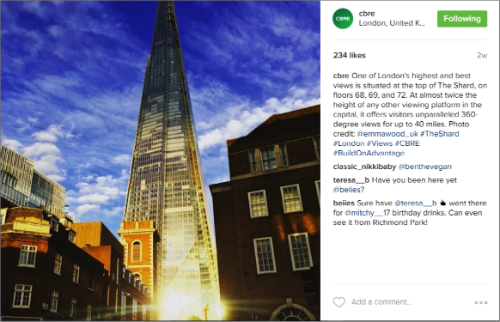 CBRE is a global commercial real estate company with an Instagram account that features gorgeous commercial buildings, skylines and architecture from all over the world—and oftentimes those images are UGC. The key here is that they go beyond ordinary and choose images that are eye catching, interesting or innovative—to show what inspires them to work harder at what they do. For many of us in the marketing world, Adobe has brought us the design tools that make our lives and jobs so much better. Their Instagram account is all about art and design, featuring an eclectic mix of interesting images with nearly all of them being UGC. 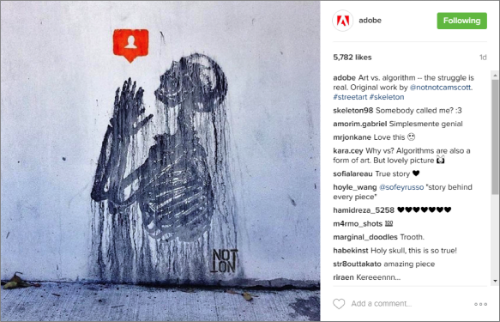 Adobe boasts 205,000 followers and typically sees some great engagement on their posts. At the time of this article, this post had been up for just one day and already had 5,753 likes and 25 comments. Define what you want to say with each post. Images often speak for themselves, but put a little context into the reason you’re sharing the image. Consider posing a question to encourage engagement, but make sure you keep up on the thread and respond in a timely fashion. And of course, don’t forget to include relevant hashtags so more people can find your content. 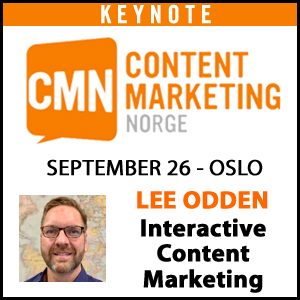 Make it your mission to find the best content possible. UGC is no different from more traditional content. Quality is definitely better than quantity. Peruse your followers’ accounts or use the search function to find content for specific hashtags that are relevant to your brand. Look for images that speak to your brand and message that have already seen some engagement on the original account. Stay active to maximize engagement. As you saw in the Buffer examples, keeping up on the activity your posts are receiving and taking steps to grow the conversation shows your followers you’re there and you care. Launch a contest or giveaway. What better way to encourage people to share their images and videos with you than to offer a little incentive? Just make sure your contest rules specifically outline how you will be using the content they share for transparency and legal purposes. Look to your employees for content. 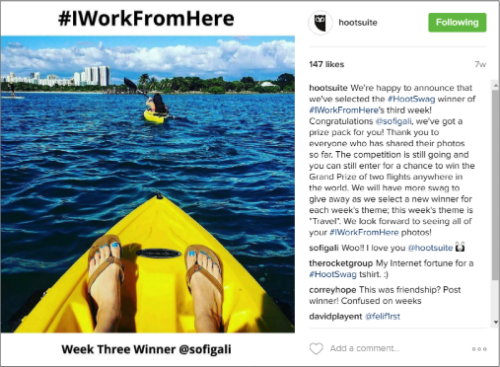 If your mission is to give your followers a glimpse into your company’s culture, some of the best UGC you can find is from those who have their boots on the ground. Get permission to share. Getting permission not only covers any copyright issues down the road, but also personally connects you with someone in your audience. They’ll appreciate you letting them know and they may even jump in on the feed to engage when you mention them in your post. Credit the original source. If you get the green light to share content, make sure to share their handle and give them credit in your post. Utilize “Repost for Instagram” tool. Combine No. 7 and 8 with the Repost for Instagram app for iPhone or Android. This allows you to share any content, while also giving credit to the original poster. 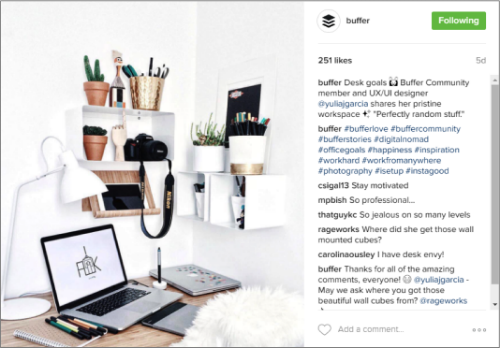 Read “9 Awesome Tools to Up Your Instagram Marketing Game” for more marketing tools that could help your efforts as a whole. 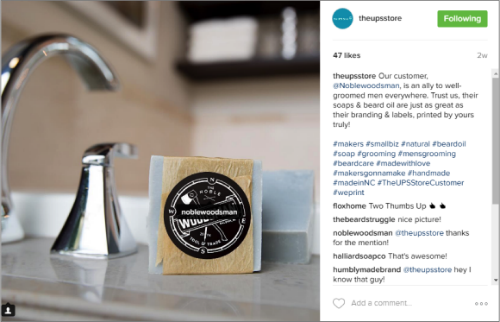 Does your B2B or B2C brand incorporated UGC into your Instagram strategy? What advice to your have for other brands? Share them in the comments section below. Follow TopRank Marketing on Instagram for more insights into our digital marketing agency.